Recently, I watched Generation War again. It’s German-made series about World War II. There are three episodes, each one lasts an hour and thirty minutes. I think it’s a good picture, but there are a couple things that I don’t feel are accurate, most notably are the partisans in Poland being anti-Semitic. That put me off. I looked into it and found out that, yep, the Polish partisans were most definitely not anti-Semitic. They are credited for rescuing many Jews from the Holocaust. But otherwise, I really enjoyed this series. First time I watched it was about a year ago. I watched it again a month ago. 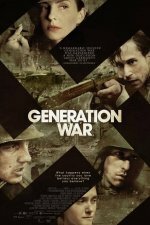 Generation War is about five friends from Berlin. Two are brothers and they’re in the German army. One is a nurse, one becomes a singer. One is a Jewish man who attempts to flee Germany, but finds himself swept up in the Holocaust. So, each of the five have their own story. They thought the war would be over by Christmas and they would all reunite at their bar in Berlin. But the war dragged on much longer.